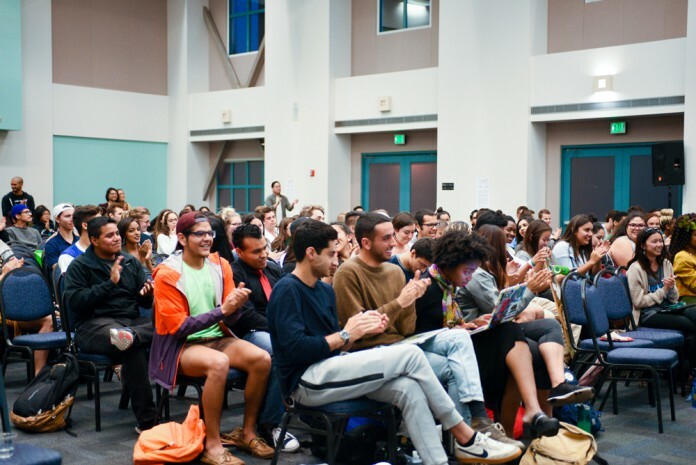 Students packed University of California, Santa Barbara’s Corwin Pavilion on Wednesday, April 27 to discuss the recent recommendation by Associated Students Elections Board for a revote on the full 2016 ballot. At that night’s A.S. Senate meeting, over 100 students and A.S. staff members debated the legitimacy of the final results and fairness of certain campaign tactics. It came to light on Tuesday, April 26 that the Inter-Fraternity Council offered incentives in the form of philanthropic grants to campus fraternity chapters for voting in the 2016 A.S. elections. Elections Board released a statement to the press that morning offering some details of the case and its revote recommendation, igniting concerns about the effectiveness of a revote and the degree to which the grants could have influenced the election’s outcome. Elections Board first caught wind of the IFC incentives during the mid-April campaign season, via an online portal designed to log anonymous elections complaints. The board was therefore prompted to begin investigation prior to receiving an “unsolicited” letter from IFC President Brendan Gonzalez confirming the council’s decision to award grants to chapter members. Newly-appointed A.S. Attorney General Brandon Lee announced during his first president’s cabinet report that he would be launching an investigation into the IFC incentives, while the senate directed A.S. President Jimmy Villarreal, Executive Director Marisela Marquez and Vice Chancellor for Student Affairs Margaret Klawunn to seek professional legal counsel in the upcoming week. The counsel and investigators will work separately but collaborate. Senate had questioned the six Elections Board members for over half an hour following their reading of a prepared statement, seeking details about the board’s decision to act on the IFC’s self-reported grant initiative. In response, Elections Board stated that Graduate Student Association President Aaron Jones and A.S. Community Volunteer Coordinator Ruth Garcia Guevara gave input during its discussion. But the board upheld its confidentiality policy regarding complainant identities, and reinforced that it is not seeking to impose consequences but ensure a fair election. “[The IFC case] is not a claim; they admitted to it,” said Elections Board member Tiffany Yeh. Though each vote is weighted equally in elections, an incentive offered exclusively to one group of students could demographically skew voter turnout to favor certain student interests over others. Fourth-year political science major Brandon Morse raised questions during public forum as to whether small campaign giveaways like donuts, cookies or t-shirts often seen in A.S. elections can also be considered forms of coercion. He pointed to the California Elections Code, which outlaws such practices for public entities like UCSB. A.S. is a 501(c) nonprofit organization that adheres to the California Business Code rather than the CEC, according to clarification by On-Campus Sen. Batsheva Stoll. Jones further clarified that A.S. adheres to both codes as a department of the university and a 501(c), and said legal counsel will investigate the matter according to both codes. Jones also admonished the senate for its treatment of Elections Board at the meeting, as did numerous students who spoke during public forum. Jones also spoke personally, stating his disappointment in some senators’ opinions that A.S. staff were not impartial on the matter, due to their presence at the April 25 Elections Board meeting discussing complaints. UCSB alumnus Brandon Yadegari also criticized the Senate for asking questions he felt were inadequate, and said Klawunn and Chancellor Henry Yang should formally delegitimize the student government if the elected executives and senate are sworn in. Yang has the ability to take such action should he decide the situation calls for it. “These financial incentives raise ethical and legal questions suggesting bribery at best and collusion at worst,” Yadegari said. Gonzalez, along with Office of Student Life Director and IFC Advisor Miles Ashlock, made an appearance during public forum to clarify what they believe have been misconceptions held by the general public. “Personally, if I thought that what they were discussing were a bribe, that’s something I would have intervened upon,” Ashlock said. He also stated that other UCSB organizations have used similar practices in the past to encourage higher voter turnout among their members, though he did not list specific organizations. Other California college student governments have recently come under fire for ethical violations. UC Riverside student officials are considering a campus revote due to campaign “laptopping,” in which candidates or party members approach students with electronic devices to directly solicit votes. Some consider the practice to fall under coercion and harassment, and it is banned by UCR’s elections code. In another case, Chapman University’s President-elect and Speaker of the Senate Austin Kernan resigned after administration discovered he had stolen funds from his fraternity. Looking to highlight a more positive instance of incentivization, Off-Campus Sen. Jerel Constantino brought up a similar case at UC Berkeley in which Greek life offered food rewards on a first-come, first-serve basis to any student who voted, regardless of his or her individual affiliations. For instance, the first 500 voters on a given day of voting received a free cookie if they used a provided computer to vote. Cal Greeks did not endorse a specific candidate at the booth, but rather, sought to incentivize students to vote. The majority of students who spoke at the meeting called for an investigation into the matter rather than a revote, although public opinion regarding who should conduct the investigation was split. Some preferred an internal investigation engaging advisors from the Office of Student Life and A.S., while others called for local authorities to investigate. There was some concern about conflict of interest should senate conduct its own investigation, as some candidates elected to serve as executives next year — namely President-elect Hechler — sit on this year’s senate. “Is it wrong to assume that members of the Senate were selected because they could put aside their party affiliations and any other affiliations they may have to vote in an unbiased manner?” Elyasi asked in response to some students who expressed such skepticism. First-year global studies major Joel Ruiz implored senate to put aside party divisions and call for a revote, ultimately demanding that they accurately represent all students on campus.